FloZF data acquisition and device control. Note: You must be logged in to download our software. Intuitive and versatile user interface. Support for a wide range of fluid handling devices. Convenient addition of other devices that are controlled by either serial commands or digital IO. Handy manual controls for system debugging. Powerful sequence controller with real time status, pausing, editing, and halting. Re-use of optimized sequences with simple “Find and replace” feature. Support for Windows XP, Windows Vista, and Windows 7 operating systems. Single channel or multiple channel data acquisition. 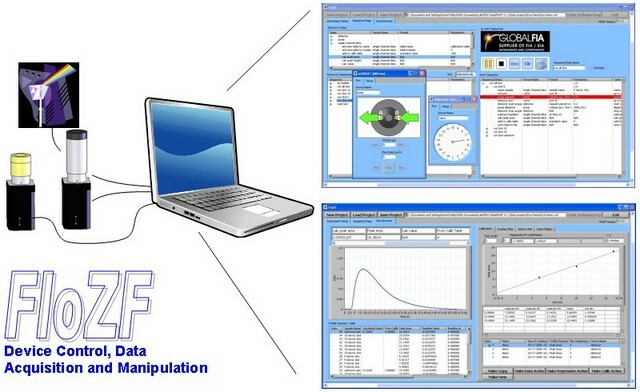 FloZF is a device control, data acquisition, and data processing package designed for the development and operation of fluidic systems such as chemical analyzers. In particular it is well suited to exploring the power of Zone Fluidics. In FloZF, the user builds and manages Projects which consist of hardware Device configuration information, the Sequences to control the devices, and data acquired from any detector devices in the Project. These three primary components of the Project are managed from their respective pages in the software package. Device configuration takes place in the Instrument Setup page (see screen shot of the Instrument Setup page). A device is added to the Project from a list of Available Device Types. The device is then configured and tested from inside its own Instrument Panel. Depending upon the device, the Instrument Panel may also provide for “manual” control and monitoring of the device. Sequences are created, edited and executed on the Sequence Page (see screen shot of the Sequence page). There are three panels on the Sequence Page as well as several buttons. The Resource Steps panel (at the top right) contains the building blocks of Sequences: device-specific Steps, system control Steps, and data manipulation Steps. These Steps can be dragged and dropped into the Work Sequence panel (on the right) to generate method Sequences. From here, the Steps can be modified, grouped, saved, and executed. Groups of Steps can be assembled into hierarchical arrangements of Sequences which are listed in the Resource Sequences panel at the bottom left. These Sequences are dragged to the Work Sequence panel for modification, printing, and execution. The Data Browser page is used to examine detector data, create and modify calibration tables, and manage data folders (see screen shot of the Sequence page). Data are stored in folders and one folder is designated as the Active Data Folder. The Data Browser page is separated into two partitions. In the left partition, a Profile Summary Table provides specific data for each profile that has been acquired and stored in the Active Data Folder. When an entry in this table is selected, the data profile appears in the plot window above the table. The significant peak parameters are listed in a table above the profile window. In the right partition of the Data Browser page is another set of tabbed pages containing various groupings of data. Calibration tables are assembled on the first tabbed page and can be filled by dragging and dropping entries from the summary table. It is possible to generate calibration tables manually from the summary table or automatically from within a Sequence. Where it is desirable to overlay peak profiles, the second tabbed page allows the generation of Overlay Plots by dragging entries from the summary table. On the third page a graphical history of any of the peak parameters can be displayed in History Plots as histograms. The final tabbed page, Data Folders, allows you to create, open, or delete data folders. The Active Data Folder is selected on this page. A free fully functional evaluation version of FloZF is available to download. This version will allow device control of Global FIA milliGAT pumps and Valco selection valves. These two devices are the core of any Zone Fluidics implementation.